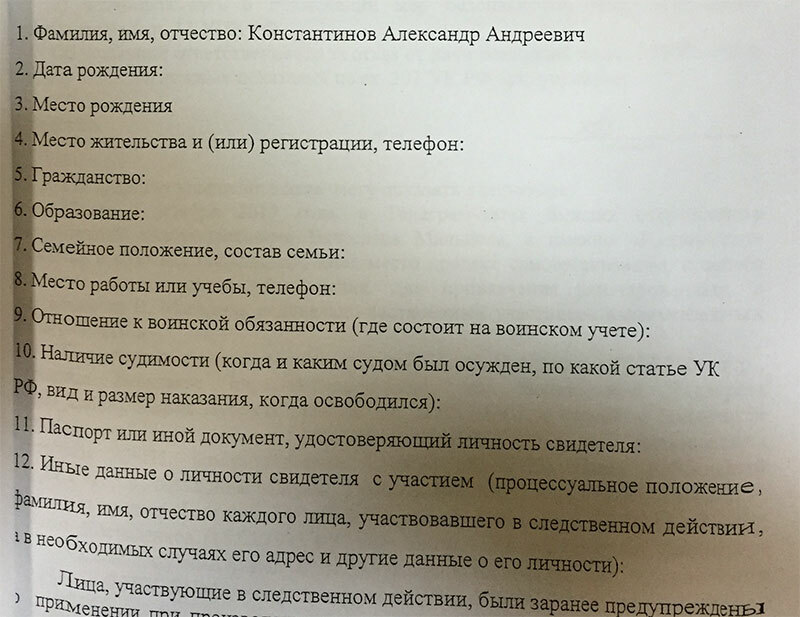 Members of the previously unknown New Greatness movement were detained and then remanded in custody in mid March in Moscow, accused of organizing an “extremist community.” OVD Info has examined the case file. Apparently, the movement was led by undercover law enforcement officers. 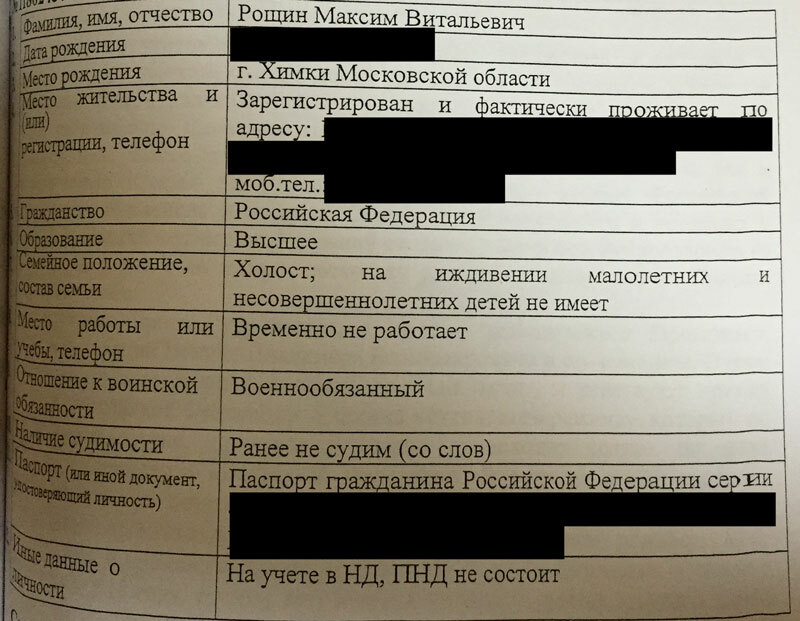 Police searched the homes of members of the opposition New Greatness (Novoye velichiye) movement on March 15 in Moscow, as reported by the Telegram channel Kremlin Washerwoman (here and here). The grounds for the searches were not reported. As witnesses confirmed, a list containing the names of ten of the movement’s members was confiscated during one of the searches. According to unconfirmed reports, Russian Federal Security Service (FSB) officers were present at the search. A bit later, a video of the movement’s leader, Ruslan Kostylenkov, confessing his guilt during an interrogation, was posted on the internet. According to Kostylenkov, the organization’s objectives were “establishing order in the Russian Federation, organizing a tribunal for members of the ruling elite, and abolishing repressive laws and the Constitution.” When asked how the movement’s members intended to accomplish this, Kostylenkov replied they planned to organize rallies and carry out [militant] “actions” [aktsiyi] against law enforcers. After the searches, Kostylenkov, an underage female, and seven other people were detained and sent to the Russian Investigative Committee’s Western Administrative District office in Moscow. The next day, March 16, Dorogomilovo District Court in Moscow remanded seven members of New Greatness, including the underage girl, in police custody for two months. Two other members were placed under house arrest. All of them were charged under Article 282.1 Part 1 of the Russian Federal Criminal Code (“organization of an extremist community”). Kostylenkov was among those remanded in police custody. On March 20, the Moscow News Agency reported that a criminal case had been opened on March 13, that is, two days before the searches and arrests. Citing a source in law enforcement, Moscow News Agency also claimed that the organization’s objective had been the commission of crimes motivated by political hatred [sic] of the current Russian federal constitutional system. In addition, members of New Greatness had repeatedly organized sessions in Moscow and Moscow Region at which they had received training on how to participate in protest rallies. The agency’s source noted the training sessions involved the use of firearms and explosives. 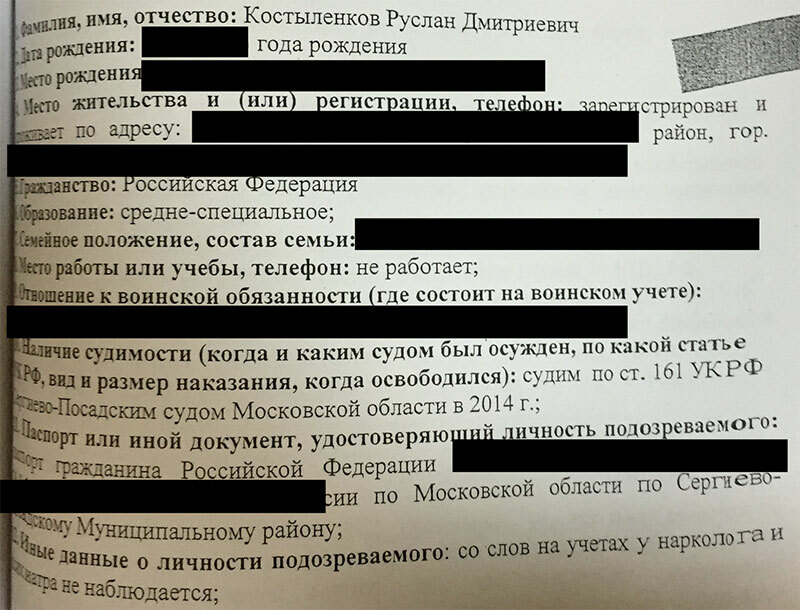 The members of New Greatness have been charged under Russian Federal Criminal Code Article 282.1 Part 1, i.e., they have been accused of organizing an extremist community. The Criminal Code defines an “extremist community” as a group of people organized for the planning and commission of “extremist crimes.” People found guilty of organizing an “extremist community” can be sentenced to a maximum of ten years in prison, while people found guilty of being members of the group (as covered by Article 282.1 Part 2) face maximum sentences of six years in prison. The Russian Supreme Court has ruled that criminal liability for violating the law begins at the age of sixteen. The official commentary to Criminal Code Article 282.1 states that the group in question must be “stable,” meaning the people in the group had got together beforehand in order to plan and commit the crimes. The group must have an organizer and a stable membership, and the actions of the group’s members must be coordinated. OVD Info has been able to examine the case file, which we received from the lawyer of one of the accused men. These documents let us take a slightly broader look at the members of New Greatness, their activities, and the roles they were assigned. The case file contains the following information about some of those in police custody and the members who avoided arrest. Maxim Roshchin, a 38-year-old unemployed man from Khimki, Moscow Region. Roshchin was not involved in shooting practice, and knows nothing about any other training sessions. Pyotr Karamzin, 40 years old. He knows nothing about protest rallies timed to coincide with the presidential election and was not involved in discussing them. Karamzin tried to take part in the first training camp, but the group “got stuck in the snow.” Like all the other members, he gave money to Ruslan D (see below), with whom he once went to a protest rally. When Karamzin realized the rally had not been authorized by the authorities, he left. Pavel Rebrovsky, a 31-year-old unemployed Muscovite. Rebrovsky was head of the so-called militant actions department. He treated his duties as a joke and ignored them. He did not engage in any serious discussions, since he realized it would be impossible for ten people to overthrow the government. He gave cash to Ruslan D.
Vyacheslav Kryukov, a 19-year-old student in his second year at the Russian State University of Justice. He moved to Moscow from Gelendzhik. He donated money to the group simply out of curiosity. He wanted to listen to discussions of Russian politics, but the meetings were closed to people who did not make donations. 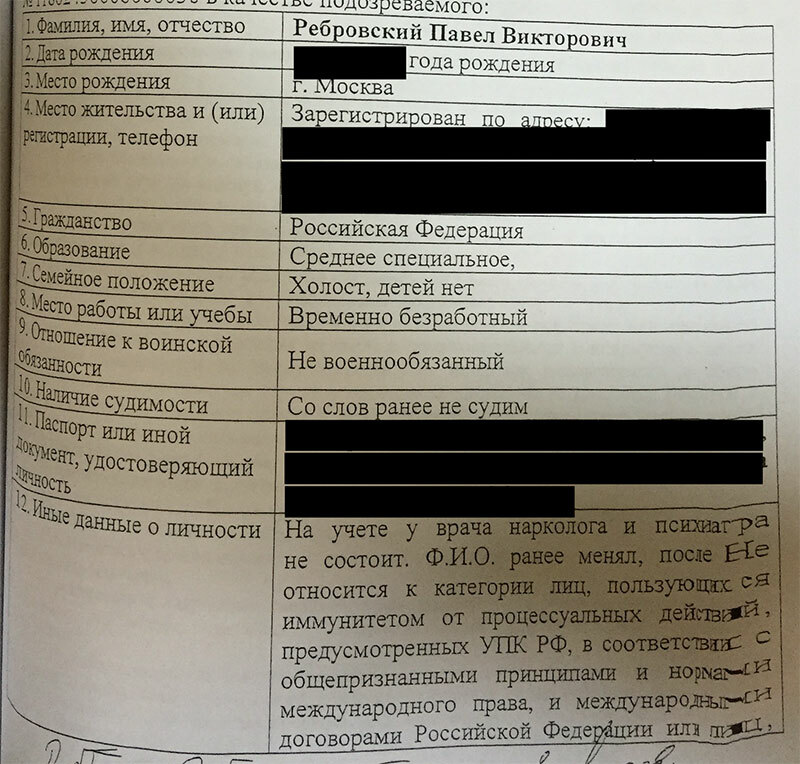 Like the other members, he gave money to Russlan D, who, according to Kryukov, also looked for rooms to hold meetings. Ruslan Kostylenkov aka Ruslan Center, 25 years old, previously convicted of robbery. The group’s leader, as he himself recounts in the interrogation video published by Kremlin Washerwoman. The following members of the New Greatness community were interrogated on March 13. The same day witnessed the opening of the criminal case on whose basis nine people were detained and then remanded in custody on March 15. The testimony provided Konstantinov, Rostorguyev, and Kashapov was the basis for the charges filed against all members of the group remanded to custody. Moreover, their testimony has been excised from the case file, as handed over to the defense attorneys of the arrested members. Konstantinov, Rastorguyev, and Kashapov were not arrested themselves. Alexander Konstantinov aka Ruslan D aka Spaniard (not to be confused with Ruslan “Center” Kostylenkov). 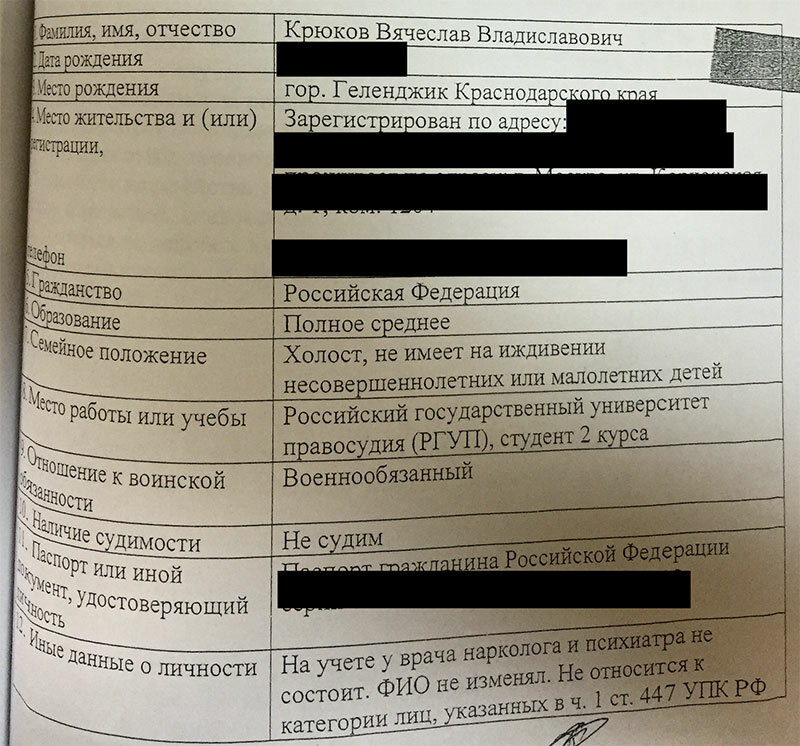 Konstantinov’s profile in the interrogation protocol is blank. He admits he was involved in New Greatness “in order to subsquently identify the members,” inspect documents, and gather important information to pass on to law enforcement. Konstantinov identifies himself as head of the financial department. However, as follows from the testimony of other members, as cited above, there was only one member who located and rented rooms for group meetings: Ruslan D aka Konstantinov. According to the group’s leader, Kostylenkov, it was Ruslan D who drafted the group’s charter. Maxim Rastorguyev is a 29-year-old senior investigator and police captain. He was assigned to inflitrate the group. 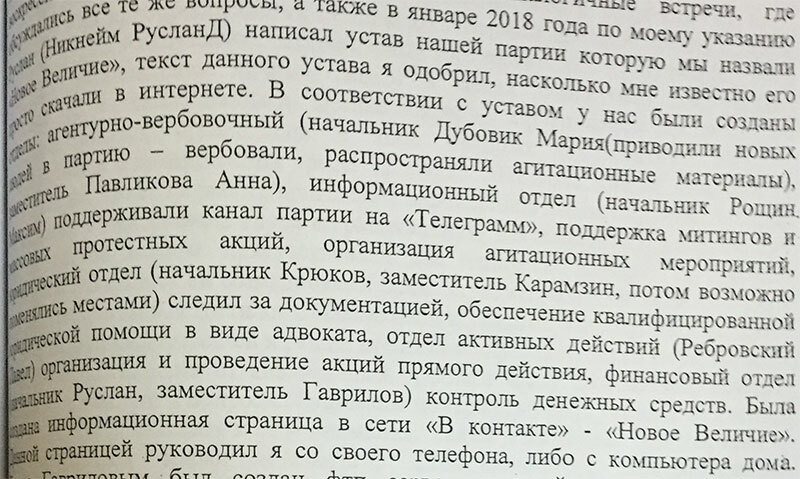 In his testimony, Rastorguyev said Ruslan D’s involvement in the group was part of a police investigation, a “strategic infiltration.” Along with Ruslan D and Ruslan Center (Kostylenkov), Rastorguyev was involved in organizing an assault squad. Identified as leader of the assault squad, Rastorguyev helped other members of the group make Molotov cocktails. Rustam Kashapov is a 28-year-old military engineer. According to the testimony of one of the arrested members, it was Kapashov who brought weapons and ammunition to one of the group’s training sessions. Three members of New Greatness were interrogated three days before the searches and arrests: Konstantinov, Rastorguyev, and Kashapov. The criminal case was opened after the three men were interrogated. Their testimony is the basis for the charges against other group members. According to the case file, all three men were involved in organizing the group and arranging the training sessions, drafting the charter, collecting dues, and renting space. According to the charges, these actions were, in fact, the grounds for detaining members of the New Greatness movement and remanding them in custody. Konstantin, Rastorguyev, and Kashapov avoided arrest. One of the three men—Rastorguyev—has testified he was assigned to infiltrate the group. The testimony of all three men has almost been entirely excised from the case file that was handed over to the arrested men’s defense lawyers. Thanks to Comrade NN for the heads-up. Translated by the Russian Reader. It should be obvious by now the Russian security services were tasked with inventing domestic “terrorist” and “extremist” groups from scratch in the run-up to the March 18 presidential election and this summer’s FIFA World Cup, which Russia will host, and then unmasking, apprehending, and prosecuting the fruits of their own sadistic fantasies. To my mind, this should be a huge scoop just waiting for an ace reporter at a big-name western newspaper or magazine if only he or she would take the time to look over the ample Russian press coverage of the Penza-Petersburg “terrorism” case, the strange investigation of the real “terrorist” bombing that occurred in the Petersburg subway in April 2017, and the curious case of the the New Greatness movement, which, as the article above suggests, was conjured into existence by Russian undercover police themselves. The question is why, when this website and other activist websites have been at pains to give “real” reporters one and one and one, they cannot add them up and get three? Or they are simply too afraid of the collective Putin and its wrath to cover these flagrant miscarriages of justice?